Welcome to Alisal Pet Clinic! Alisal Pet Clinic is dedicated to providing the best veterinary care for your pets. We believe that pets are a part of our family and we respect the bonds created between them and their owners. We strive to provide everyone a caring and compassionate atmosphere when you bring your beloved pets to our clinic. 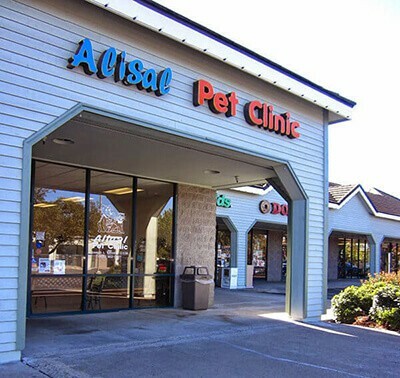 Located at the Oak Hills Shopping Center (near Raley’s Supermarket) on Sunol Blvd., Pleasanton CA, Alisal Pet Clinic offers comprehensive veterinary services for dogs, cats, rabbits and pocket pets such as guinea pigs, hamsters, rats and mice. Since its acquisition in 1998, Alisal Pet Clinic has provided thorough and accurate veterinary care to thousands of patients in the Tri-Valley area. We always welcome new clients and patients to our animal clinic in Pleasanton. Check out our list of services or contact us to find out what we can do for you and your pets. They take good care of our two cats. The vet and his assistants are all gentle and warm people, and they put the cats at ease right away. That's saying a lot for our cats! I have brought five animals through over the years and they have all been wonderful experiences (even though the visits were not usually for wonderful reasons!). Thank you, team, for all that you do. The team at Alisal did a great job from care to follow up with the utmost sense of urgency. Would recommend Alisal per clinic highly!